The Age of Consequences: Eye-Opening Documentary Screened at AU Focuses on how climate change will be predominant force shaping 21st century. Hoover Institute Research Fellow Alice Hill, Department of Environmental Science Professor Kiho Kim, Francesco Femia, president and co-founder of the Center for Climate and Security, and School of International Service Professor Paul Wapner. The College of Arts and Sciences brought together the fields of environmentalism, international relations, and security studies with a screening of the groundbreaking new documentary The Age of Consequences on April 5. Released in January 2017, The Age of Consequences explores climate change as a threat to national security. Through interviews with military experts and analysis of the impact of climate change on resource scarcity, mass migration, and global conflict, the film introduces a perspective rarely discussed in the realm of environmentalism. Students, faculty, and staff members from across AU’s schools gathered for hors d'oeuvres and refreshments before the film. Following the screening, Hoover Institution Research Fellow Alice Hill moderated a panel discussion featuring School of International Service Professor Paul Wapner, Department of Environmental Science Professor Kiho Kim, and Francesco Femia, the president and co-founder of the Center for Climate and Security. 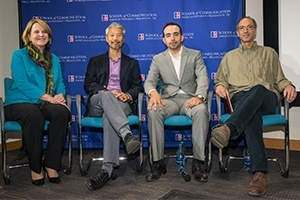 Topics covered during the discussion included the consequences of climate change, the difficulty of communicating environmental risks, and the future of climate issues under the Trump administration. Kim and Femia both noted the importance of seeking solutions from multiple sources, as well as the need to avoid relying too much on technological solutions. While the speakers expressed concerns about the future of climate change policies, Wapner and Kim agreed that they find hope in the optimism and determination of their students. During the last half hour of the event, speakers answered questions from the audience. Students raised questions about water security, funding cuts to environmental NGOs, and the effect of nationalism on future responses to migration issues. At the close of the event, Hill thanked audience members for their attendance and encouraged them to keep up the conversation about climate change. “Until we get a collective voice that signals that this is important to us, and we care about it, and we want to leave a safer place for ourselves and our children, I think it’s going to be difficult to build the kind of clamor that we need to move forward,” Hill said.